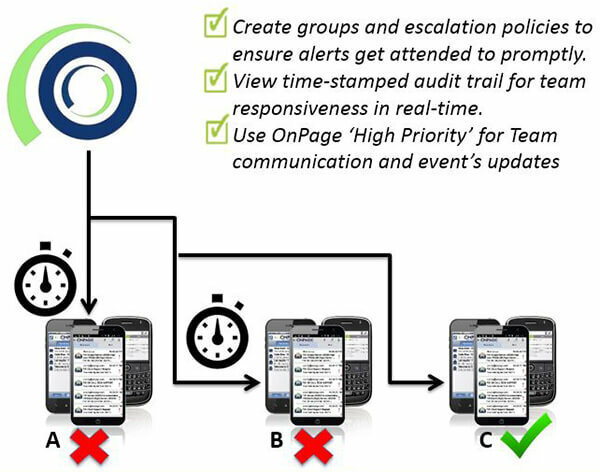 OnPage Corporation, a pioneer in cloud-based pager replacement and IT alerting, brings its signature message-sent validation to paging via telephone. OnPage announces the release of an enhanced version of its paging via telephone service that ensures pages are sent to the intended recipients, and informs the caller whether the message is sent or the intended recipient is not accepting pages. This feature overcomes the long-standing problem associated with telephone paging of not knowing the fate of a sent page. By borrowing from its award-winning priority round-trip alerting technology, and leveraging Cisco’s voice-over-IP technology, OnPage telephone paging service now confirms via voice commands that the caller entered the correct number/USERID before sending the page. It also checks to make sure that the intended recipient is accepting pages, and informs the caller whether the message was sent or the recipient is unavailable. In March 2016, OnPage will further enhance its paging-over-telephone service by offering direct-dial dedicated phone numbers vs a central call-in number, as well as other useful features. “By providing message assurance to telephone paging, we are increasing the efficiency and reliability of priority communication for health-care providers, whose patients still rely mainly on telephone-paging,” said Judit Sharon, CEO of OnPage.